Lindy Hop is a fun, energetic, and versatile form of swing dancing that has surged in worldwide popularity over the last three decades. Today, Lindy Hop is THE dance of choice among modern swing dance crowds across the globe, with dances in every major city and lindy exchanges every weekend of the year! Whether the music is classic or contemporary, Lindy Hop is a great dance to know for just about any occasion. It can be danced to tempos from slow to fast, to just about any kind of music! 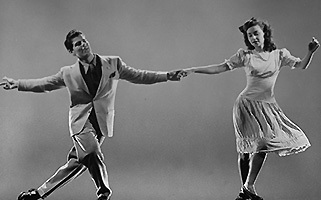 Despite its modern following, Lindy Hop is known as the original swing dance, dating back to the late 1920's. Lindy Hop was hugely popular during the original swing era of the 1930's & 1940's, gracing the cover and pages of Life Magazine on numerous occasions, and appearing in movies too numerous to mention. Lindy Hop is, to put it simply, more-advanced swing dancing. It offers the most opportunities for advancement in social dancing of any swing dance, and it's also the most impressive swing-dance form to learn for performances and competitions. In fact, Lindy Hop includes all of East-Coast Swing, both single-step and triple-step variations, and all of Charleston, meaning that anything you can dance in East-Coast Swing or Charleston, you can also dance in Lindy Hop. But Lindy Hop adds a whole new world of possibilities to your swing dancing, from Swing-Out variations, to sophisticated styling, to syncopations, to advanced footwork, to jazz steps, to advanced partner interactions. The bottom line is Lindy Hop is a must-learn dance for those who wish to progress in their swing dancing beyond East-Coast Swing. You've seen it at swing dances everywhere, and now it's your turn to learn and dance the Lindy Hop! Our innovative teaching methods will have you swinging the Lindy Hop in no time. Whether you're new to Lindy Hop or have taken several classes, try these out — we know you'll like them! Our Lindy Hop classes are designed for everyone, from novices who've never danced before, to experienced dancers who've been dancing several years. There are no prerequisites, so anyone can drop in and take them. All classes stand on their own; you need not take one to take any of the others; but the more you take, the better your dancing will be! No partner is needed.